Welcome to Agtronic Motorsport! 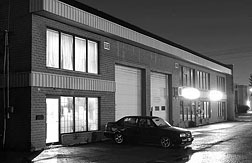 We are a high-end automotive welding and fabrication shop operating out of Laval, Quebec, just 20 minutes north of Montreal, Canada. We specialize in the design, fabrication and modification of high-performance vehicles and parts. With over 8 years of welding experience and a strong understanding of the latest high performance technologies, we have the skill, the knowledge and the confidence to build the high performance project car you have always dreamed of. 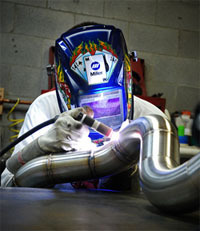 Our specialty is fabricating custom exhaust headers and manifolds for turbo conversions. If you are building a turbo kit for your vehicle and are having trouble finding components, we can fabricate them for you for a painless install. Whether you need a custom manifold for your Japanese sportsbike or a complete intercooled twin-turbo setup for your V8 musclecar, we will deliver a finished product that is custom tailored to your needs. All of our manifolds feature aircraft-quality welding performed by a fully certified welder and we maintain the latest standards for welding stainless steel, inconel and titanium. We also fabricate custom stainless exhaust systems. We use only the finest quality sanitary grade stainless steel on all of our systems. Whether you are looking for a long lasting quiet system that fits just right or a large diameter high-flow system to maximize engine output or an esthetic beautifully-welded system for your show car, we are the leader in high-end fabricated exhausts. Our systems are guaranteed for life, despite the fact that even a Canadian winter is no match for durability. All welding is performed in-house by an accredited welder. Welding exotic metals correctly takes experience. This is especially true of parts that are subject to harsh conditions, such as turbo exhaust manifolds made of stainless steel. Tubular manifolds have a reputation for being unreliable. Often people don't realize that this bad rap is the result of many parts being poorly welded. There are many questionable parts on the market, fabricated by questionable outfits. Do yourself a favor and do not fall victim to pretty polished parts that are poorly made. At Agtronic Motorsport, no corner is cut and every effort is made to ensure a quality part that will last for years to come. If you are looking for the instant gratification of browsing through pictures of our work, click on the "gallery" button in the top menu bar. For information about our welding and fabrication services, refer to the "services" section of the website. If you are looking for a quote on a welding or fabrication job, or if you are looking for directions to our facility, please click on the "contact" button.